While the PlayStation 4 is considered to be beating the Xbox One when it comes to overall sales, it seems Sony is spending more money in promoting its now-gen console compared to Microsoft — at least when it comes to TV commercials. In a report by research firm iSpot, it states that Sony has spent $59 million on PlayStation TV ads from January 1, 2014 to the end of May; compared to Microsoft’s expenditure of $34.7 million for Xbox TV ads during the same time frame. Both video game makers focused their advertisements on the same TV channels such as FOX, ESPN, and Comedy Central, with Sony pouring more money into FOX Sports 1 and TNT, while Microsoft focused on TBS and AMC. The report mentions that Sony’s most “digitally effective” ad is the “Greatness Awaits” spot, which aired 1,058 times on national TV since its debut in March, and is estimate to have cost $9 million in ad money from Sony so far. The “Greatness” ad, is said to have received more than 2.5 million views online and more than 17,000 social interactions, which include tweets, shares and “Likes” on Facebook. For Microsoft, the most effective ad is said to be the “All-in-One” spot that shows off everything the Xbox One can accomplish. This marketing assault aired more than 1,300 times on TV since its debut in January and has an estimated ad spend of $12 million. To date, it has amassed more than one million online views and 6,000 social interactions. As a whole, the entire video game market spent $226.5 million on TV commercials in the first five months of the year according to iSpot. For reference, Microsoft was the biggest spender last year when it came to ads with a total of $73.6 million on TV commercials, which was followed by Activision, who spent most of its money promoting Call of Duty. Interesting to see that even if Microsoft has more money in the bank than Sony, the company spent less in promoting the Xbox One. Maybe it’s gearing up for a big push in the latter half of the year? 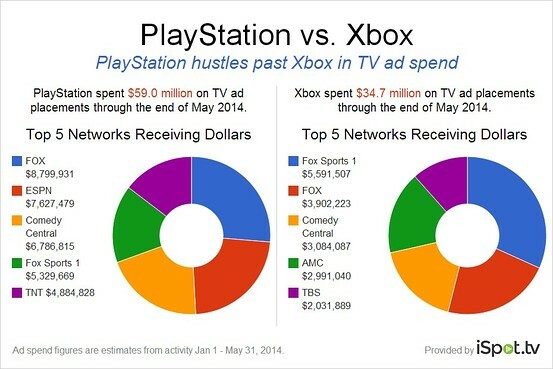 Have you seen more PlayStation ads compared to the Xbox One on TV? Which marketing push do you prefer?